Adapted from the American Plains Indian use of buffalo horn for utilitarian objects, this is ancient functionality raised to intricate fine art stone and shell inlay. 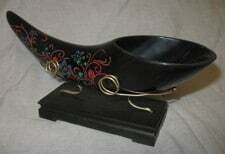 The drinking horn is black buffalo horn, hand cut and delicately inlaid with Magnesite, Lapis, Malachite, Pipestone, Mica, Coral, and Mother of Pearl. The spoon is black buffalo horn, hand cut and delicately inlaid with Lapis, Malachite, Pipestone, Coral, and Mother of Pearl. The display stands are hand carved ebony and hand-wrought brass. Cup - 9 1/2" x 6" x 3 1/4" / Spoon - 4 " x 8" x 2 1/2"